An article by Oliver Wainwright on theguardian.com - Back to the art cave! 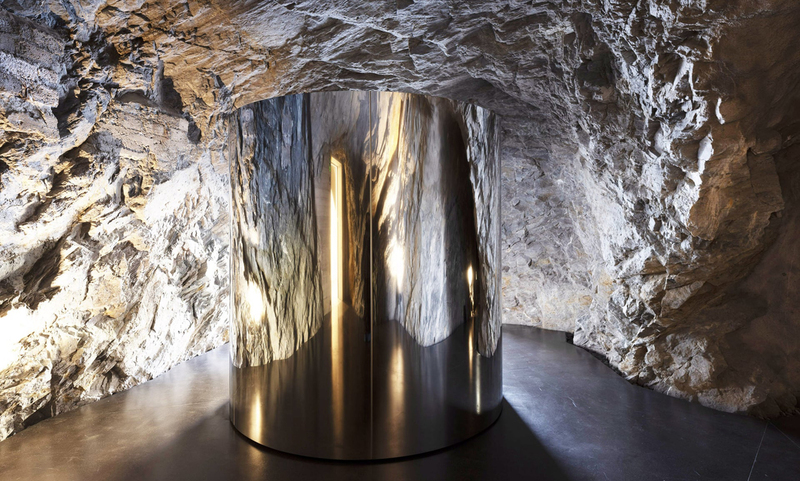 Inside Switzerland's magical new gallery - reports on the new Muzeum Susch in Switzerland. The rotating polished steel cylinder by Mirosław Bałka at Muzeum Susch. Photograph: Studio Stefano Graziani/courtesy Muzeum Susch, Art Stations Foundation CH. 'Pebbles from a nearby riverbed form a chunky cobbled floor in the entrance to the new Muzeum Susch in Switzerland - the project is the brainchild of Grażyna Kulczyk, former wife of the late billionaire industrialist Jan Kulczyk - as if a tributary once flowed through the building. Maybe it still does. The sound of dripping water can be heard coming from the end of a corridor, where a shiny trickle snakes down a bare rock face. There are other strange things going on. Where nature ends and artifice begins - Muzeum Susch. Photograph: Studio Stefano Graziani/courtesy Muzeum Susch and Art Stations Foundation CH. Peer through one opening and you find a gnarled column of earth plunging down into the basement, as if it's the remains of an archaeological dig. Another passage is encrusted with viscous white goo, forming stringy stalactites that lead to a curious cave downstairs. Editor's note: Where art and geology collide; one wonders what our artistic ancestors would have made of this. Well, we know the caves were chosen - not all caves in Europe have Palaeolithic art - and the placement of the art was always considered - certain sections of the cave were selected and the art often incorporated the topography of the cave walls. It would seem that art and geology have always gone hand in hand. Parts of the walls show clear signs of fire damage, with the stalagmites blackened or reddened, and fractured from the heat, leading researchers to suspect that the Neanderthals embedded fireplaces in the structures to illuminate the cave. Image: Etienne Fabre/SSAC. And not just paintings and engravings; what about structures? 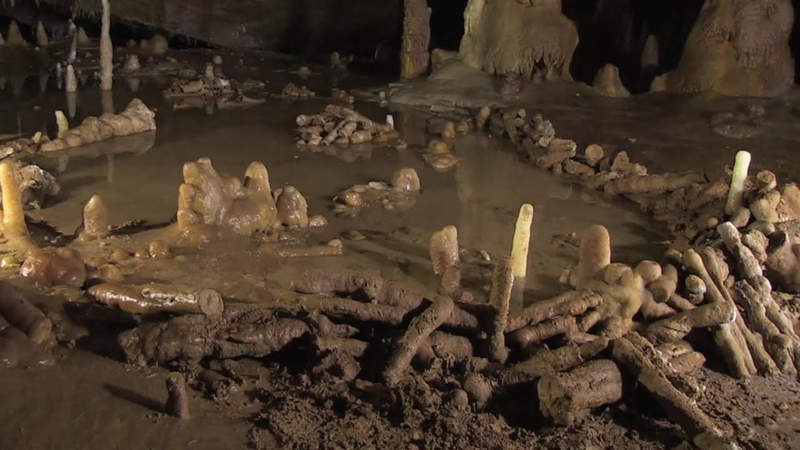 I am reminded of the structure (above) discovered 300m from the entrance to the Bruniquel cave, near the Pyrenees mountains in southwest France, deemed to be the work of Neanderthal builders who lived in the region more than 100,000 years before modern humans set foot in Europe. A 3D reconstruction of the structures in the Bruniquel cave. Image: Xavier Muth/Get in Situ, Archeotransfert, Archeovision -SHS-3D. The structure is made from nearly 400 stalagmites stacked on top of one another to produce rudimentary walls on the cave floor.